This handy collection of 176 heartfelt prayers will give voice to your thoughts, hopes, and life challenges. Prayers for family issues, friendship, celebrations, illness, loss, work, and much more will remind you that God listens, cares about your heart, and is ready to help as you look to him for inspiration and encouragement. Ellen Banks Elwell graduated from Moody Bible Institute and American Conservatory of Music. Her favorite activities are reading the life-giving words of the Bible, spending time with family, and walking with friends. Ellen has authored over 20 books, including One Year Devotions for Moms, Life is Beautiful, and a series of Piano Praise books. Ellen works in International Publishing at Tyndale House Publishers, with her husband, Jim. They live in Wheaton, Illinois, and have three grown sons and two grandchildren. 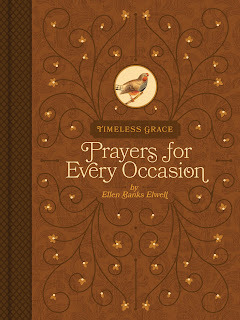 This is a lovely little book filled with beautiful prayers for so many situations and occasions! Sometimes it's so hard to know what to pray for certain situations. A person can come to you with something so difficult and we want to pray a profound, touching prayer but our minds just freeze. This little book can guide us in starting our prayer and I really like that they are so heart-felt and beautiful. There are so many prayers in this book! There are prayers for those who have lost someone in death, for surgeries, and then for all kinds of occasions and holidays. The prayers are very encouraging, but more importantly, they are very Biblical. There are so many beautiful prayers that you will never be at a loss for finding the exact prayer that you need. I really like this book and highly recommend it! I give this 5 out of 5 stars.